Mmmmmmm! This looks delicious! Where can you get freeze dried strawberries? April, I bought my freeze dried strawberries from Amazon.com. They can be hard to find. Wow, that looks amazing. I’ll have to keep an eye out for strawberry extract & the freeze dried strawberries. What does the baking soda do in the frosting? The little bit of baking soda and lemon juice react and create air holes in the icing , which makes it fluffier. What brand of strawberry extract did you use? Is it an imitation extract? Also, is your cake flour Swan’s? 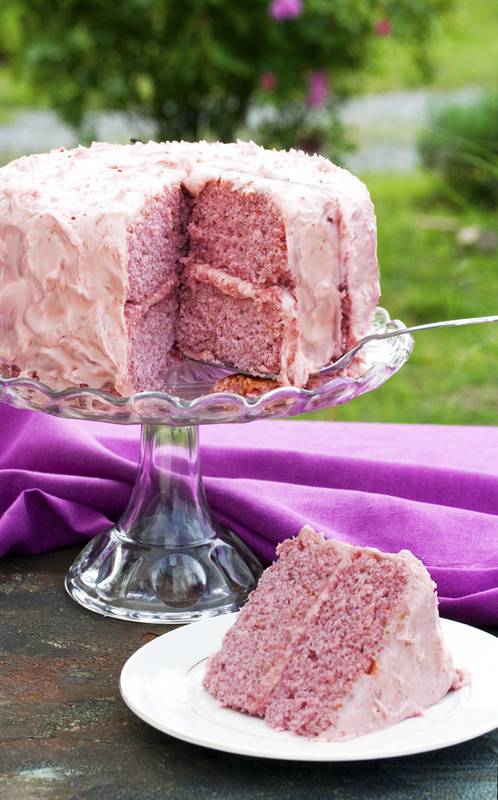 Angel, I used Cook’s pure strawberry extract and yes I use Swan’s bleached cake flour, I find it works the best. Does anyone know what 1 cup of freeze dried strawberries would equate to with powdered strawberries? I can buy both but don’t have a food processor so hoping to just go straight to the powdered version! Thanks to anyone who knows! Thank you for such a great recipe!I ended up doing it with freeze-dried raspberries instead (Trader Joe’s, as another person mentioned), and orange extract. Using freeze-dried fruit was genius – lovely speckled look, intense fruit flavor, and no food coloring. Thank you so much! I will use this again in the future. Thank you so much for this recipe. I made cupcakes for my non-vegan husband’s birthday and he loved them. I also used whole wheat pastry flour instead of the bleached flour. It had more of a healthy muffin consistency/flavor than cupcake, but it paired well with the sweet frosting. Thanks again for this recipe! Made this cake for my vegan daughter’s 11th birthday. I used a little less flour for the second layer, and that worked a bit better (moister and yummier) than the first layer. I also made the cake 2 days in advance, and it kept great in the fridge. Thanks for posting this recipe, which we all really enjoyed! Next up on our to-make list is your vegan gingerbread! Yum! I am really excited to find this recipe, the picture looks fab. I’m waiting for my powdered strawberries to arrive then I’ll post an update. I usually make chocolate avocado cake but need a change. This sounds amazing for my daughters 3rd birthday cake! Vicky, also can you tell us what brand and type of strawberries you used, so others will know not to use them. Making these for my fella for valentines day and could not be more excited! Strawberry cake was always my favorite, but ever since going vegan 1 year ago I haven’t been able to find a suitable replacement. Thank you so much for posting this! I can’t find strawberry extract. Can anyone offer a suggestion? Also- I’d love to make this cake in a shaped pan. Will the consistency hold up? I am interested in trying this recipe as a sheet cake. Would I need to make any alterations to the recipe as shown? I’m going to try making this cake this weekend for my daughter’s 4th birthday, but with fondant. Do you think it’ll work? Maybe less frosting on the exterior? absolutely it should work Please tell me how it went! The cake was delicious and everyone loved it! Fondant is too sweet for my taste, but it looked really good. I actually made 2 layers of strawberry cake and 1 layer of white cake with strawberry icing. Thanks for the wonderful recipes! Hi Rebecca, Have you started using freeze-dried fruit now? I’m looking to buy some but I want to hear other peoples opinions first, because they’re quite expensive aren’t they? Any help/guidance would be amazing! Could I just ask everyone a question please? Do you all enjoy/find useful using freeze-dried fruits? They seem to be coming about a little more now. They seem great! They last for ages in your cupboard don’t they? Please let me know what ya’ll all think about them :). Great recipe! Tried it, loved it! I need another one for my freeze-dried strawberry left overs :).